Lust, racism, and religious bigotry aren’t topics that are usually broached in family films. Which may explain why Disney’s 1996 take on The Hunchback of Notre Dame didn’t make much of a splash at the box office. Despite this underwhelming response, the movie has since found its audience and now commands a loyal fan base. 1. FROLLO’S JOB WAS CHANGED TO AVOID OFFENDING RELIGIOUS GROUPS. In the original Victor Hugo novel, Claude Frollo is Notre Dame’s Archdeacon. However, Disney feared that an evil priest wouldn’t sit well with Christian organizations. As such, Frollo was transformed into a judge. Furthermore, the plot’s theological underpinnings were downplayed. “[We] were told not to make the movie too religious—a pretty daunting task when you consider how much of this story takes place inside a big church,” animator Floyd Norman later said. Still, some Bible references couldn’t be avoided. Consider this: The Hunchback of Notre Dame was Disney’s 34th full-length animated feature. Just two of the film's songs—“God Help the Outcasts” and “Heaven’s Light/Hellfire”—contain more references to the words “Lord” and “God” than all 33 of Disney's previous films combined. 2. “THE BELLS OF NOTRE DAME” WAS A LATE ADDITION TO THE SCORE. The opening number can make or break a musical. Usually, it’s the song that both captures an audience's attention and sets up the story. Yet, surprisingly, Hunchback almost didn’t get one. The original plan was to start the film with spoken exposition and a flashback montage. However, this didn’t satisfy production boss Jeffrey Katzenberg. Feeling that something was missing, he asked lyricist Stephen Schwartz and composer Alan Menken to create a new song for the sequence. Singing duty mostly went to Clopin, a theatrical Gypsy voiced by Paul Kandel, who recalls that “we were about a third of the way through the process of making [Hunchback]” when this ballad was completed." 3. THOSE SINGING GARGOYLES WERE INSPIRED BY THE NOVEL. 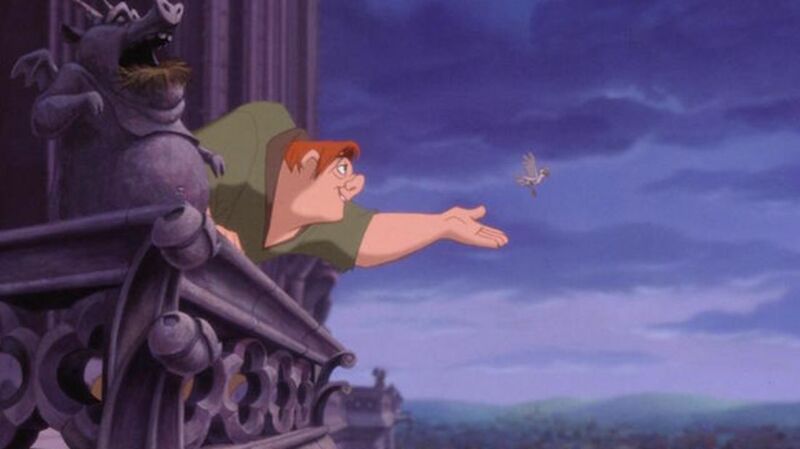 Quasimodo’s on-screen sidekicks are three wise-cracking statues named Victor, Hugo, and Laverne. Where did Disney get such a wild idea? From the source material. In the Hunchback novel, our lonesome protagonist often talks to the cathedral’s gargoyles. “He sometimes passed whole hours crouching before one of these statues, in solitary conversation with it” reads Chapter III. To create some comic relief, directors Kirk Wise and Gary Trousdale simply expanded upon this concept. 4. QUASIMODO COULD’VE BEEN VOICED BY MANDY PATINKIN. In The Princess Bride (1987), Patinkin took a stab at movie immortality by playing sword maestro Inigo Montoya. Several years later, Disney offered him a very different role. After Patinkin left the medical drama Chicago Hope, the studio asked if he’d consider voicing Quasimodo. He immediately said yes, but soon ran into trouble. Hunchback had already been converted into several live-action movies—including a 1939 classic starring Charles Laughton as Quasimodo. Since Laughton is Patinkin’s favorite actor, he wanted to emulate that performance. But the producers insisted on a friendlier bell-ringer. “They had their own Disney needs,” Patinkin told the Los Angeles Times. In the end, Quasimodo was voiced by Academy Award nominee Tom Hulce. 5. SOME SCENES WERE ENHANCED WITH COMPUTER-GENERATED TOWNSPEOPLE. Back in the mid-1990s, hand-drawn animation was still Disney’s favorite technique. Nevertheless, the studio had been integrating computer effects into their feature films ever since 1986’s The Great Mouse Detective. For Hunchback, a special program was used to generate large crowds of people. Both the Feast of Fools scene and the climax are riddled with digital Parisians. Six different body types (male and female) were created in order to pull this off. Each individual bystander was given a unique set of motion instructions. These were randomly drawn from a set of 72 predetermined movements such as clapping and jumping. 6. “HELLFIRE” WAS MODELED AFTER AN ITALIAN OPERA SONG. Composed by Giacomo Puccini between 1899 and 1900, Tosca is now one of the world’s most popular operas. Act I ends with a song that’s guaranteed to give goosebumps. Called “Te Deum,” it belongs to the villain, Scarpia, who sings about his diabolical plans with a chorus of churchgoers. Almost a century later, Disney gave us the equally unforgettable “Hellfire”—Frollo’s epic solo. “Te Deum” was the song’s main source of creative inspiration. 7. DISNEY ASSUMED THAT THE FILM WOULD GET A PG RATING. The Hunchback of Notre Dame deals with very taboo subjects, from sexual fantasies to eternal damnation. (There’s also scene where the female lead pole dances.) Naturally, Disney executives didn’t think that the MPAA ratings board would apply their “general admission” stamp. Screenwriter Tab Murphy “fully expected it to get a PG.” As he told the Chicago Tribune, “It felt like a PG movie to everyone, including everybody who signed off on it, from Michael Eisner to Roy Disney.” News of the board’s decision to rate it G was met with widespread disbelief. “Maybe it was the gargoyles,” Murphy suggested. 8. VICTOR HUGO’S DESCENDANTS HATED IT. 9. JASON ALEXANDER WOULDN’T LET HIS OWN SON SEE THE MOVIE. 10. BELLE FROM BEAUTY AND THE BEAST MAKES A CAMEO. Keep your eyes peeled: When Quasimodo sings “Out There,” Belle can be seen wandering through the streets of Paris—and, true to form, she’s got her nose stuck in a book. Look carefully and you’ll also spot a peasant shaking out Aladdin’s magic carpet during the same sequence.